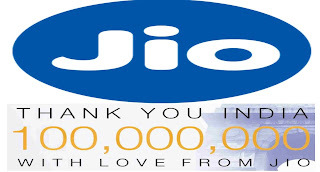 Reliance Jio Infocomm Chairman Mukesh Ambani, today annouce a very big news for jio users. Jio crossing 100 million(10 cores) subscriber base in just 170 days adding 7 customers per second. ''JioPrime'' is the most important announced today. 'JioPrime' means the 'Happy New Offer' benefits for the customers until 31 March, 2018. 1. Pay one-time subcription charge Rs.99 between 01/03/2017 to 31/03/2017. 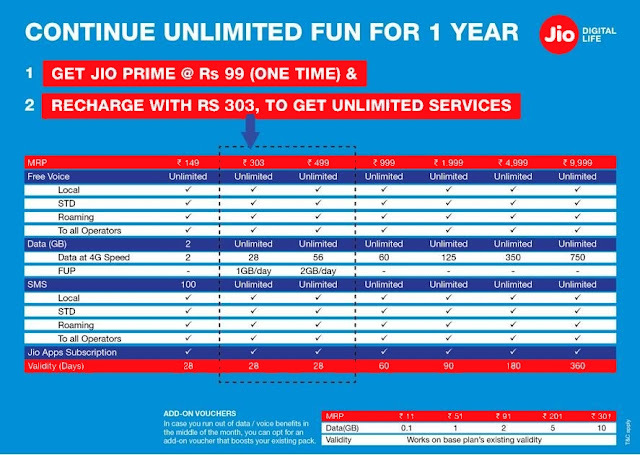 2.After JioPrime membership, every customer has to pay Rs.303 per month (means Rs.10 per day) to enjoy the free services mentioned above for 12 months up to March 2018. You can enjoy 'Happy New Offer' continue means 1GB data per day, free Jio Digital apps such as JioCinema, JioMusic, JioPlay etc and unlimited roaming free voice and video calls as well as unlimited SMS until 31st March, 2018. Note : If you are not willing to join the JioPrime member, then you can use the Jio network by paying the regular tariff plans from 1st April 2017. **You can only 'JioPrime' membership charge Rs.99 recharge through "My Jio" app.